The dream of an all-Chichester final might be over but there was drama at the university sports dome in the two South Eastern Conference Cup men’s futsal semis. The ones came from behind against Brunel twos to win 10-6. Brunel started brightly and were two up in as many minutes when a cross from the left was turned in and another effort cannoned down off the bar and over the line. Hamido Jalo got Chi back in it with a super finish before the visitors increased their advantage. Marcus Ball then made it 3-2 with a rare header and leveled things up with a shot on the turn following the time out. It was high tempo stuff. Chichester took the lead through Tom Wisely only for Brunel to hit straight back with an effort that gave Mark Waters no chance. The hosts found themselves 5-4 down but Josh Clark got on the end of a cross at close range to equalise. Ball went close on three occasions on the stroke of half time. Brunel missed a sitter just after the break before Ball gave Chi a 6-5 lead. The visitors pulled one back before the home side kicked on. Wisley joined Ball on a hat-trick with two well-taken goals – the first a fierce strike, the other a neat finish after he’d been teed up by a cushioned header. Great feet from Jalo led to his second as Chichester went 9-6 up and Matty Roberts tucked the last goal away with some aplomb. In the other semi-final the twos took the lead against Westminster ones through Pongrac Pusztay. The visitors hit back quickly before a Rhys Kemish assist was tucked away by Jake Boon. Chi keeper Tiago Pinto produced an outstanding reaction save but couldn’t keep out a close-range equaliser. A mistake at the back gifted Westminster a 3-2 lead which was extended after an audacious lob. Kemish replied immediately for the hosts to make it 4-3 but two quick-fire goals from the visitors had Chi in trouble at the interval. 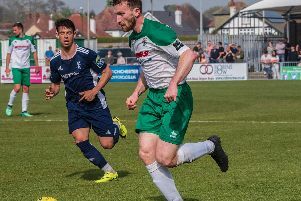 It was 7-3 moments after the restart before Tom Day bagged the first of three goals in a frenetic spell as Chichester got back into the game at 8-6. There was a huge momentum swing now and two excellent finishes from Kemish made it 8-8. Westminster then caught the hosts out on the counter attack to regain the lead. Kemish crashed a ten-yard penalty kick against the post and at the other end Pinto was forced into a couple a decent saves before Westminster failed to deal with a throw from the Chi keeper that took a nick off a defender on its way into the net for a dramatic equalizer with less than 20 seconds to go. A penalty shoot-out looked on the cards but Westminster broke home hearts with a late winner. Elsewhere, only two netball teams were in action. The fives lost their unbeaten league record and top spot in the division after they suffered a 36-22 defeat to title rivals Kingston. The fours though picked up a crucial away win at University of West London. Chi’s men’s football twos claimed bragging rights thanks to a 2-1 victory over the threes in a second league encounter between the teams. Zac Felbabel and Jamie Austin were on target for the twos with Daryl Cornelius getting one back for the threes. St George’s overtook men’s football fives at the top of their division thanks to a 3-2 win at Florence Road and the fours lost 4-3 at home to LSE twos in a see-saw game that looked to be heading for a draw before the visitors got the decider late on. Goals from Gemma Staple and Payton Howard weren’t enough for women’s football ones who lost 4-2 in the elite knock-out competition after a long trip to Leeds Beckett University. There were defeats for men’s volleyball ones and men’s rugby twos. The American football team lost 14-2 against division leaders King’s College London in their bid for a play-off place. Second-placed men’s tennis had to settle for a point in their match at home to Portsmouth. They face league leaders Surrey back to back over the next two weeks.